We return to Dressrosa after three days, as Sengoku, the marine HQ inspector and Tsuru the great Staff Vice-Admiral of Marine HQ arrive. Sengoku tells Issho that he “heard about his prostrate apology and his spat with Sakazuki“. He says that he’s glad “he’s not a Fleet Admiral anymore“. Tsuru asks why “Issho isn’t pursuing Law and the Strawhat Crew“. Issho asks if he should “make an enemy out of the pirate that save this country” or “Should I let him remain to this country, a hero“?. He reveals his die, causing Sengoku to start laughing, claiming that “this isn’t a game“. Issho says Luffy has been save twice by the die. Then he gives the die to Tsuru, saying that if “she rolled anything but a one, they would go after Luffy and Law“. Mansherry comes to the Marines, asking for a donation. Tsuru and most of the Marines think that she is “adorable“, resulting in Maujii’s anger. Mansherry says that dwarves are “only supposed to show themselves to the Royal Family, she wanted to come and heal everyone’s wounds“. Gatz announces to the citizens of Dressrosa that “Riku would return to the throne after a decade”. Elizabello II sits with Riku in the Palace and reflects “how the citizens wanted wealth and power but now they just want peace“. Inside the palace, Rebecca puts on a pretty dress, an attendant says that “she heard that Scarlett married the prince of a faraway country and so it was necessary for her to fake her death“. Meanwhile, Kin’emon and Kanjuro ride Kanjuro’s birds, talking about King Riku. They see one of the Marines selling one of Mansherry’s flower medicine. Sengoku watches Mansherry create the flowers in a tent, by sucking people’s blood. He asks if Mansherry “could take some from him next”. Meanwhile, Zoro tells Luffy about the rumors, but Luffy reacts with a “mix of anger, sadness, rushing, hunger, and sleepiness while eating meat, annoying Zoro“. 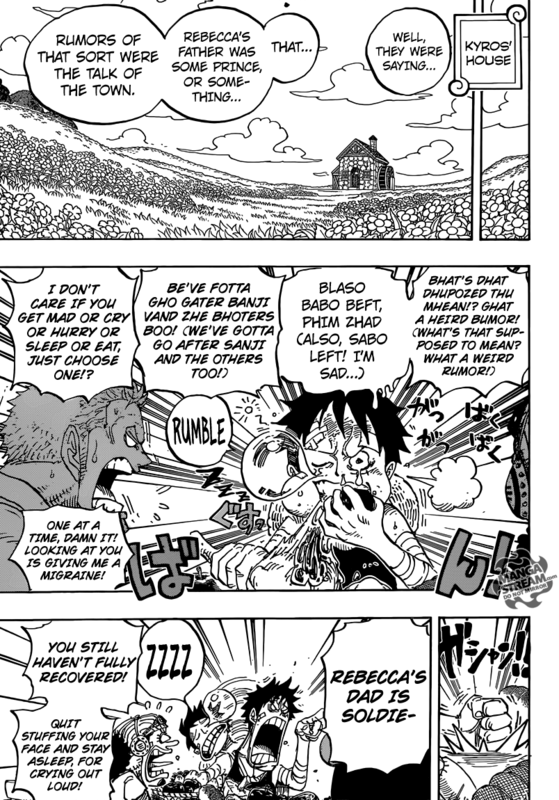 Luffy attempts to shout the truth about Rebecca’s dad, but Usopp tells him “to go back to sleep“. Kyros reveals that “he was the one who started the rumor, due to few knowing who Rebecca’s father was“. He says that “he was not the kind of person to be in the Royal Family and that the citizens knew that“. Luffy yells at Kyros, but he says that “he sent Rebecca a letter explaining everything and that he dealt with Riku about it too“. Luffy doesn’t buy it, Kyros gets a call from Leo and Bartolomeo. Bartolomeo fanboys over the Straw Hats, he reveals that “Sengoku and Tsuru have arrived“. The Straw Hats are shocked, the die gets rolled, and a six side comes up. 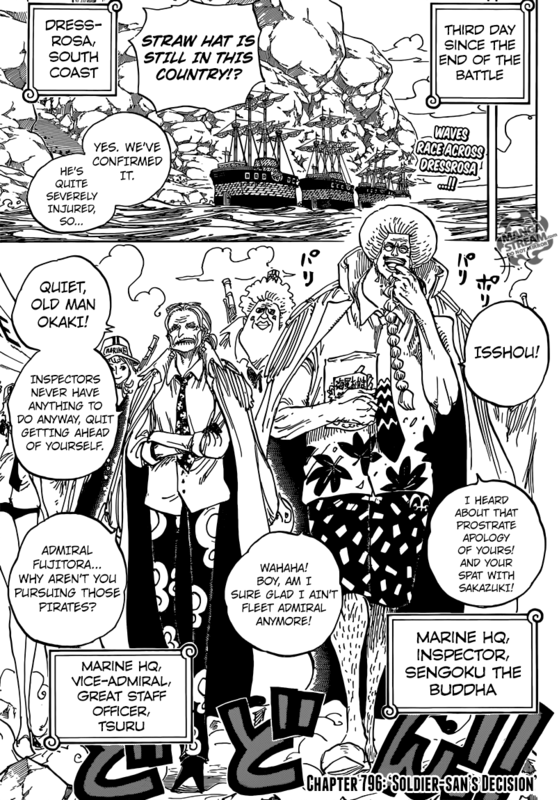 Issho orders his men to “capture the Straw Hats, Law, and all the criminals being housed at the Royal Palace“. The Straw Hats, the samurai, and Law prepare to flee, but they do not have a ship. Bartolomeo tells everyone “to follow him to the harbor, as allies from the Colosseum are waiting at points along the route, and there would be a ship there“. The Straw Hats get ready to leave, as the Marines rush toward Kyros’ house. Bellamy reveals that “he can stand due to Mansherry’s healing and asks Law why he didn’t kill him, and Law replies that Luffy said he was a friend“. The Straw Hats, Kin’emon, Kanjuro, Law, Bellamy, and Bartolomeo then run out. However, Luffy tells everyone to go a head, because “he had something to do and promising to catch up with everyone later“. 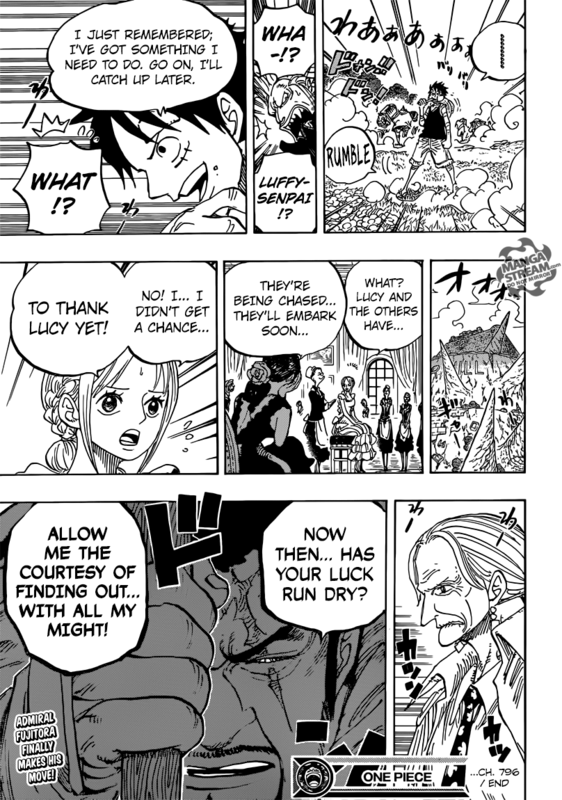 Rebecca hears that Luffy and the others are escaping, and says that she wishes she could “thank Lucy”. Issho says that Luffy’s “luck may have run out, and that he will use all his might”. Mayuri asks Pernida, “what it just said” and it needs to “stop mumbling and speak up“. Pernida says “Left… Arm…, Name… Wrong… Name… Pernidas…“, then restates its name Parnkgjas Pernida once more. Mayuri claims that he “will name it because naming rights belong to him“, sense he was the one who found it. Pernida claims it “does not understand“, before saying that “enemies are saying bad words, about Quincy“. Pernida says that this is “unforgivable“, then it sends its nerves into the ground. Mayuri is excited, as he notes that Pernida “can control inanimate objects as well“. Mayuri dodges Pernida’s attack, Mayuri then grabs onto a building with Jabarakaina, but Pernida uses his nerves to take over parts of the building pushing Mayuri off. Mayuri is crushed him between “two giant hands made of stone”. Mayuri escapes by having his “luminescent armor explode“, he falls to the ground as Pernida’s nerves attempt to capture Mayuri through the ground, Mayuri presses something on button on the back of his shoes, causing him to levitate on Reishi. Mayuri reveals this is “the Quincy movement technique, Hirenkyaku, before admitting that this is only the name that Uryu Ishida and Soken Ishida use for it“. Mayuri blows off Pernida’s pinky finger with an explosive, causing Pernida to scream. Mayuri uses preservation fluid on the finger. 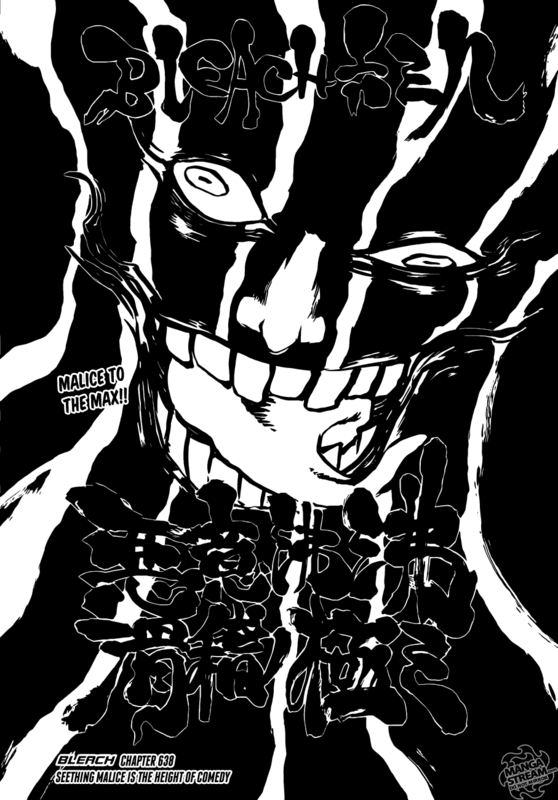 However, Mayuri is successfully attacked by the nerves, from the pinky of Pernida., Mayuri’s arms explodes, he quickly stitches it back together while “rearranging its anatomical structure before claiming that Pernida cannot take control of him so easily“. After the Kaido reveal, this chapter was always going to pale in comparison. However, this chapter was interesting. I don’t think Luffy and the others are going to get captured. That said it’s the arrival of Tsuru and Sengoku has upped the stakes. While Luffy seems to be recovering he clearly isn’t ready for a fight. I would like to see Fujitora fighting against Zoro, but I think someone will sacrifice themselves to save the the rest. Mayuri facing of against Pernida has continued to get more interesting. Mayuri’s confidence and intelligence makes his battles very interesting. He never seems to be at a lost for what he’s suppose to do, and he always seems to figure out how to win. Unlike most Captains he is constantly modifying himself and his bankai. I still think Pernida is ridiculous in its appearance, but I’ll get over it. However, now that Mayuri is pissed, things are probably over for Pernidas.